Javier Madrazo during Marriage Counseling. Javier Madrazo is a character in the HD Universe who appears as a minor character in Grand Theft Auto V.
Javier Madrazo is, in 2013, the cousin of 'legitimate businessman' Martin Madrazo who the authorities correctly suspect is the leader of a Mexican-American drug cartel. Javier steals a number of documents about his cousin and planned to testify against him in an upcoming trial. Javier continues to work with Martin, however, accompanying him and his mistress Natalia Zverovna to Michael's house and handed Martin a baseball bat to hit Michael with. Javier later decides to fly to Liberty City, leaving Los Santos with some 'innocent' documents. The plane, however, has it's second engine disabled by Michael, using a special gun from the Galileo Observatory, which causes the plane to crash land in a field next to the Senora Fwy. Javier survives but is quickly killed by Trevor who also retrieves the documents he was to use when testifying against Martin. 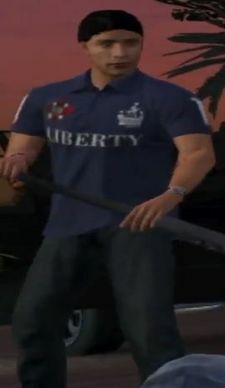 In his appearance in Marriage Counseling he is seen wearing a t-shirt with the word "Liberty" written on it and later attempts to fly to Liberty City. This page was last modified on 28 December 2014, at 17:15.